Memorials: Hope Lodge, 132 W. 32nd St, New York, NY 10001, or City Grace Church, 44 E. 2nd St. New York, NY 10003; or a charity of your choice. Theodore Howard "Teddie" Curtis, age 62, of Caledonia, was called home on Thursday, January 3, 2019. Teddie retired from Koenes Body Shop. 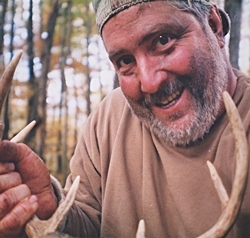 He was an avid outdoorsman, a wonderful storyteller, and a great cook and host. He will be most remembered for his passion for taking care of those around him and his legendary pig roasts. He was preceded in death by his father, Donald Curtis; and father-in-law, Bob Jekel. He will be lovingly remembered by his wife of 32 years, Patricia; daughter, Jasmine (Ben) Babcock; granddaughters, Emma, Madeline, and one on the way; his mother, Phyllis G. Curtis; sisters and brother, Jan M. Curtis (Jim Ketcham), James D. (Susan) Curtis, Emily A. Curtis; mother-in-law, Kay Jekel; sisters-in law, Sue (Randy) Kreuzer, Deb Meindertsma; many nieces, nephews, cousins, aunts, uncles; brothers from other mothers, Woody, Buzzie, Big Money, Deputy Don; and his dog, Buck. The family would like to thank Drs. Ford, Aaberg, Fredrickson, Carvajal, Sobolevsky, Chen, his guardian angels in Michigan and New York for their wonderful care of Teddie. The family will greet visitors on Sunday from 3 - 7 pm at Stroo Funeral Home. The funeral service will be held 10:10 am on Monday, January 7, at Alger Park Christian Reformed Church, 2655 Eastern Ave. SE, with Rev. Ecko DeVries and Rev. Sam Gutierrez officiating. Interment will be in Mount Ever-Rest. In lieu of flowers, memorial contributions may be made to Hope Lodge, 132 W. 32nd St, New York, NY 10001, or City Grace Church, 44 E. 2nd St. New York, NY 10003; or a charity of your choice. Ted was such a wonderful human being whose love for life and gregarious laugh, made each of us feel safe and loved. Love & prayers for Pat, Phyllis, Jasmine and the rest of the clan. Godspeed.